It’s December 27, and since 7:30 a.m. on Christmas morning I have not been doing much beyond building with Legos, acting out scenes from “Frozen,” working on jigsaw puzzles, and eating cookies. Love it! Last weekend kicked off a pretty intense run-up to Christmas. 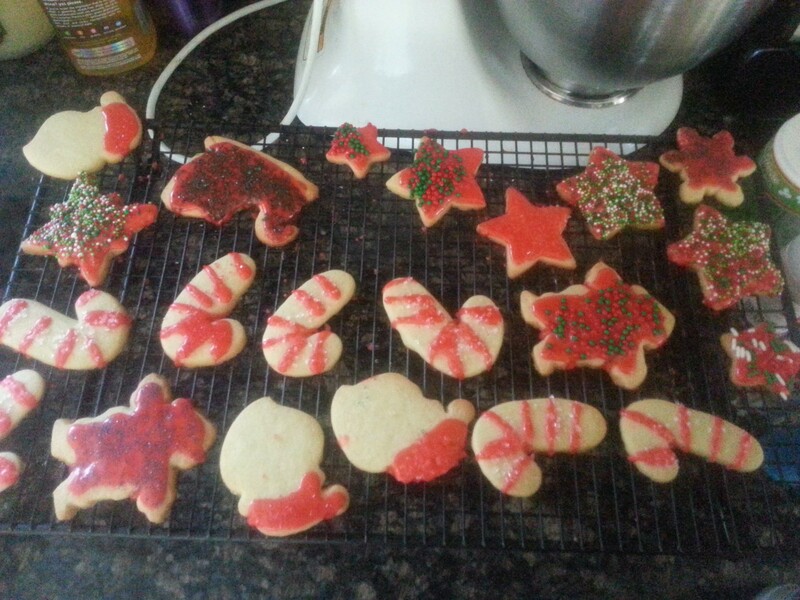 Saturday, I made sugar cookie dough, then took the kids to a nearby downtown to do a bit of shopping for my husband. The kids were horrible, but at least we got out of the house. 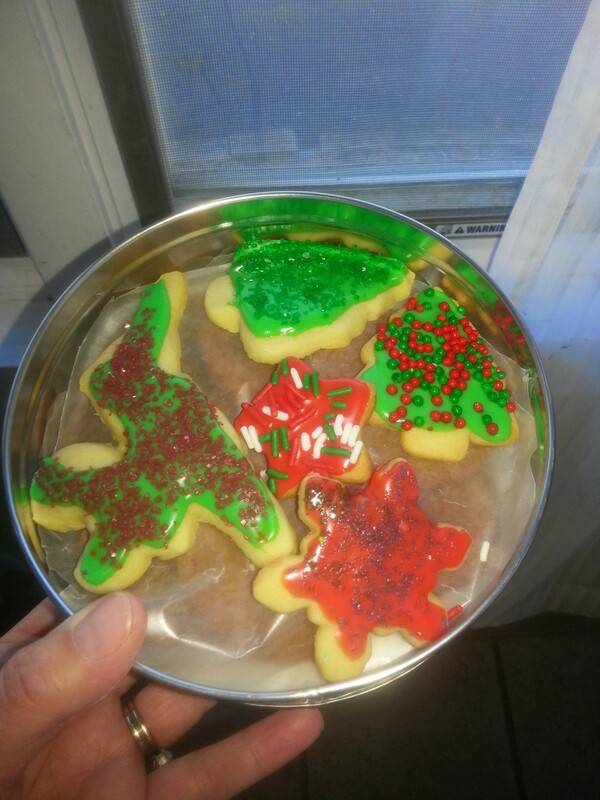 Back home, I baked the cookies and did some decorating, using a simple milk plus confectioner’s sugar glaze that I made in several colors. 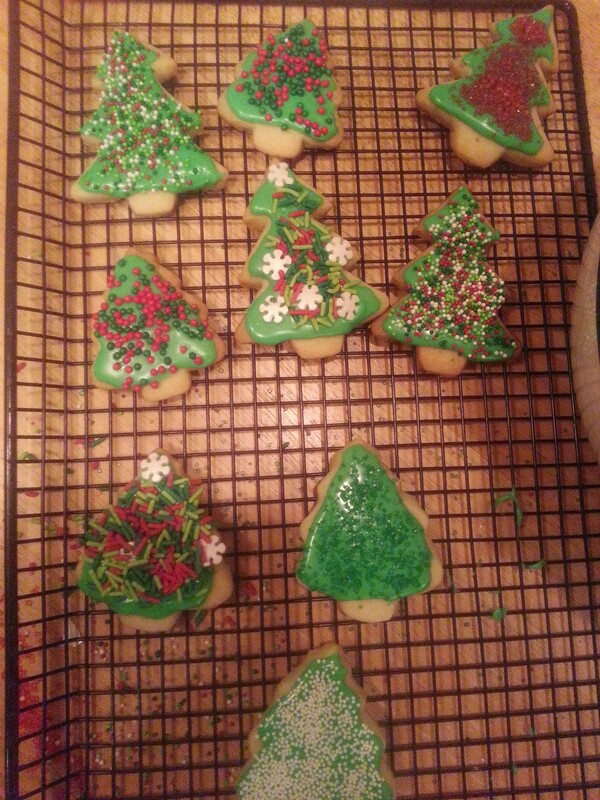 I was a bit of a control freak with the cookies, and felt bad about it, so in the morning we had a round two of decorating where I let them do what they wanted as far as decorating (more or less). My biggest beef with them is their insistence on eating the decorations. 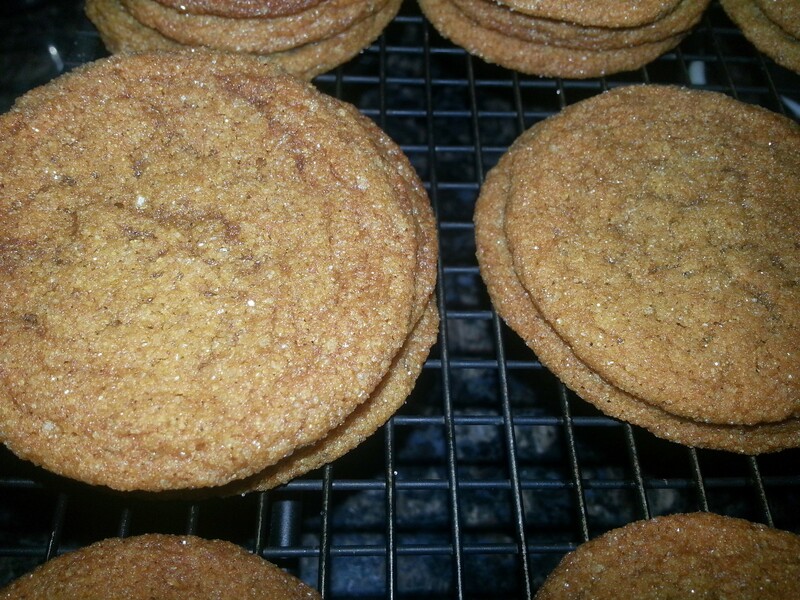 Somewhere in there I baked gingersnaps, too. We went to a family Christmas party Sunday afternoon, then my husband and I went shopping Sunday night because he wanted me to help him pick out presents for me (but I couldn’t have them until Christmas morning). It was a fun night, and not just because I let my consumer side run rampant in Macy’s and at Sunglass Hut. It was just nice to hang out with him and make fun of weird clothes and talk about something as random as fashion. Monday, we delivered some cookies to neighbors and the crossing guard. 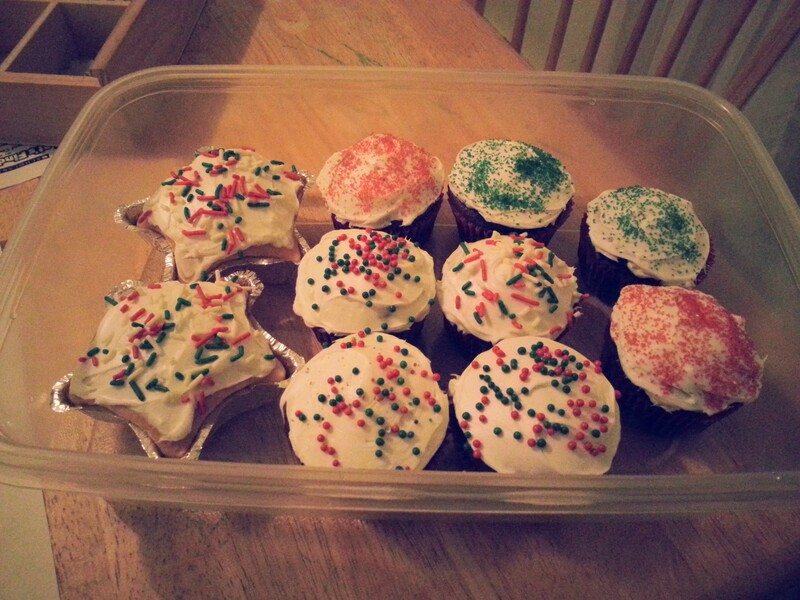 Monday night, I ended up having to make cupcakes for both my sons’ parties (long story): about 55 total. Baking them wasn’t bad, but icing them took forever — I was up til 11:15 pm doing that, and that was with my husband helping. In between baking and decorating, I took the boys out to grab dinner, buy dress shoes (after my husband pitched a fit about them not having any), and get some groceries for Christmas Eve. That was a long night; we were all up late. Tuesday, after the school parties were over, the boys came home, and vacation had officially started, I committed to staying home, cleaning, and getting as much ready before Christmas Eve as possible. So I cleaned and decluttered; wrapped a few last-minute gifts; made gravy; rolled silverware in napkins and started getting out all the fancy dishes and serving plates; and worked on my craft gifts. It was a busy but cozy day. Finally, Wednesday, Christmas Eve. It poured rain all day. I was so thankful when my husband volunteered to go pick up the stuffed shells we had ordered for dinner. I did the last-minute cleaning (vacuuming, litter box, etc. ); finished my craft gifts; and wrote out a list of things for my husband to do while I was at 4 o’clock Mass, so that the party could start at 5:30 as planned. This whole thing of going to 4 pm Mass AND having Christmas Eve dinner at my house is something I’ve been trying to pull off successfully for years. Christmas Eve is my favorite day of the year, hands down, and it’s the mass and the party that make it so. But I can’t have the party too late because the kids melt down (including, now, my little nephew). And I can’t go to Mass too late because I get too tired. Last year, I kind of just shouted instructions at my husband as I left for Mass, and he wasn’t too happy. This year, the kids were older, which always helps; I really had a lot of stuff done and ready ahead of time; and I left hubs detailed written instructions and a timeline. So when I walked in after Mass with the boys, the shells were ready, guests were arriving, my daughter was dressed, all the candles and outside lights were on. Perfection! Yes, you can have your cake and eat it too, if you are as stubborn as I am. 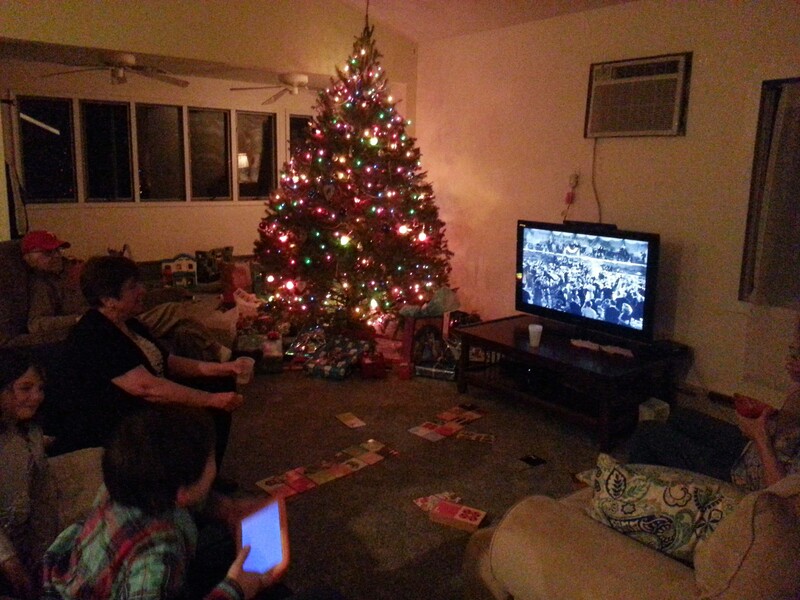 So Christmas Eve was wonderful: loud, fun, family, friends, kids, food, It’s a Wonderful Life on TV, cannoli, pie, presents. Well worth all the preparation. And then once everyone had gone home, we got the kids to bed, after amping them up with mysterious sleigh bell sounds (piped out of the bathroom window by my husband’s phone). And then I made about six trips from the first floor to the third floor to cart all the presents down to the tree while my husband lugged some in from the garage. I was up til 1, mostly because I didn’t want the night to be over. The kids slept in til 7:30. I thought my oldest might figure the Santa thing out this year, but seeing all the gifts under the tree, and getting the thing he most wanted, seemed to reignite his belief. He actually did a fist pump when he opened his big gift, which caused me to mentally pump my own fist. Yeah Mom! My younger son waved toward the heavens and said, “Thank you, Santa!” And they all acted like angels for the rest of the day, as if they knew they really hadn’t been good enough prior to Christmas to warrant what they got. Soooo… now it’s over. We stayed home Christmas Day and played and napped and ate leftovers. It was glorious. 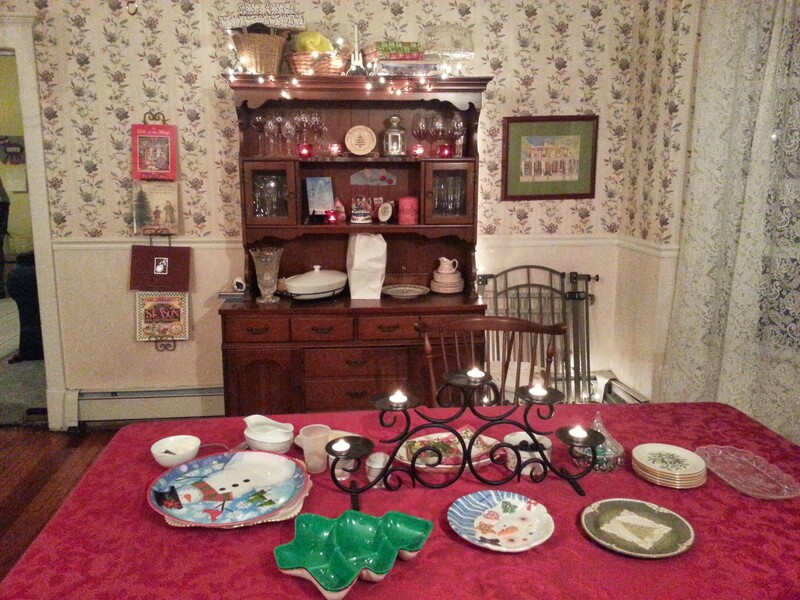 Today it’s back to business as I get ready for another family holiday party, being held here tomorrow. I looked at the Christmas budget last night and added in the last few amounts spent. I came in about halfway between the “typical” and “nonconsumer” budgets that I talked about earlier. More than half of what I spent was on the kids. 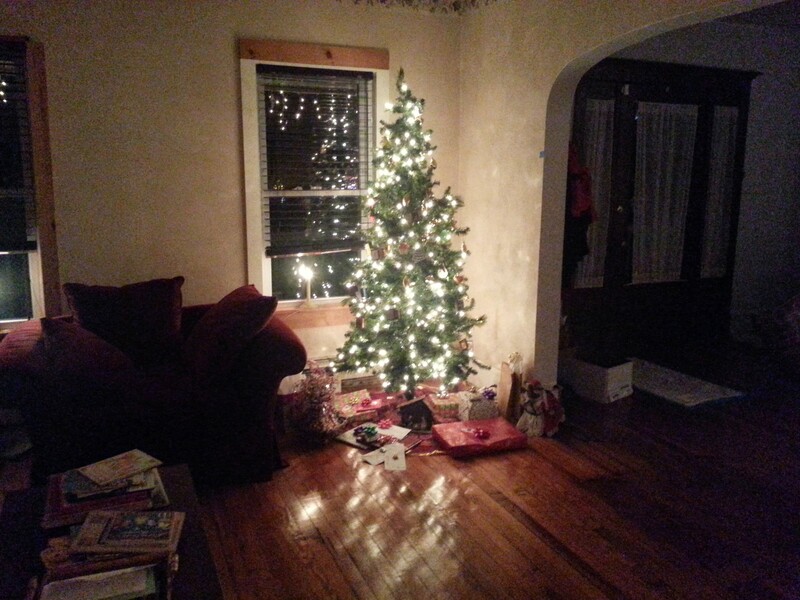 I could definitely have gotten them fewer things, and my husband added some things at the last minute, as he always does. But virtually everything they got was something they loved or really liked, and of pretty good quality. I wasn’t just buying crap so that they would have more gifts to open. The other thing is that we didn’t do any activities at all. My husband was too busy. Maybe next year we’ll be able to “do” more rather than “get” more. Ack. It’s hard. I sort of agree with that article that was making the rounds on Facebook by the mom who was unapologetic about buying her kids lots of Christmas gifts, reasoning that she says “no” all year long. I feel like that. 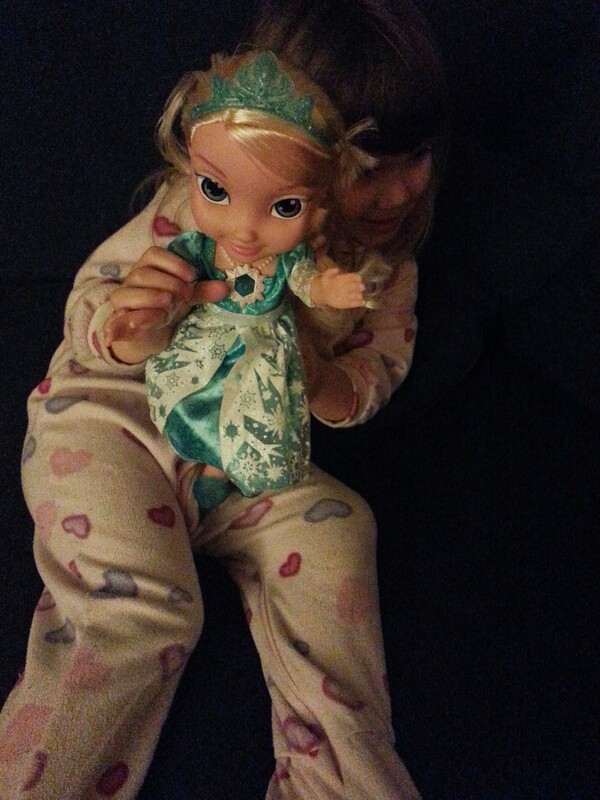 I never buy stuff for them “just because.” I only do it “because”: because it’s Christmas or because it’s your birthday. The End. So next year, I would start the cookies and crafts earlier. I did enjoy attempting the craft, and I do think that most people appreciate handmade gifts and the time that goes into them. I’ll also try to take full advantage of freebies. This year, I dug up some random gift cards my mom had somehow gotten to two stores and passed along to me. I was able to use them to get certain gifts. But I also had gift cards to Kirkland’s and HomeGoods that I didn’t use. Today I’ve been fighting an urge to go to CVS and buy Christmas stuff on sale. But I just can’t think of anything I need. 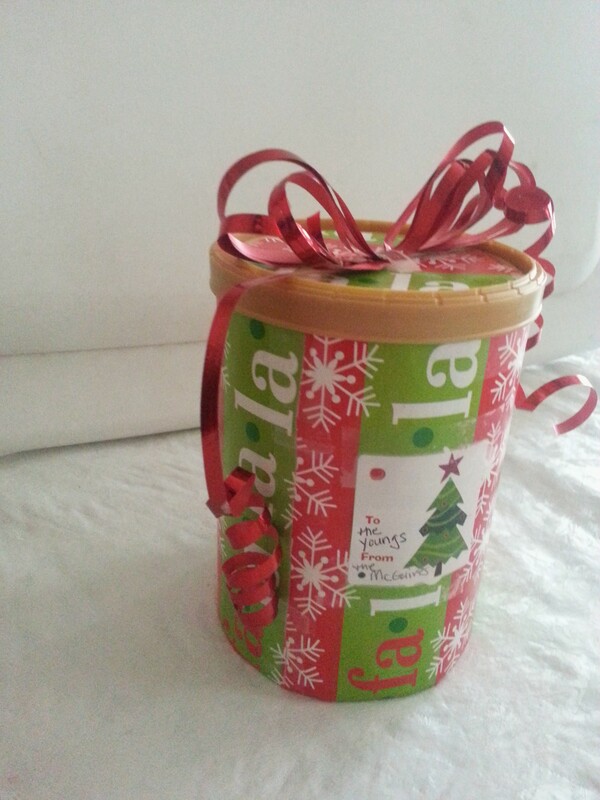 I still have tons of wrapping paper, tags, and gift bags. 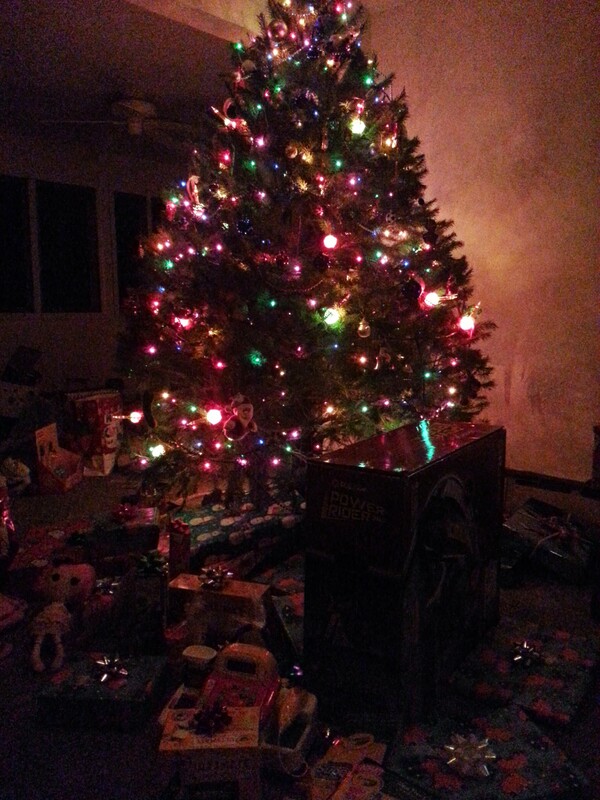 We have more ornaments and lights than we can put up. I did shop online late on Christmas night, at Bath and Body Works. When I see “75% off”… I swoon a little. I bought some lotions and stuff, for the teachers for next year. I just have to make sure I don’t hide them away and forget about them between now and then.